Download Root-i9001-Signed as well as the UnRoot-i9001-Signed from here to your computer. After this, connect your phone to the computer using the original USB cable and copy the two zip files in your phone in such a way that they are not placed deep into any of the sub folders. Now, remove the connected USB Cable and turn off the device so that you can then then enter the device in the recovery mode. Recovery mode can be entered by pressing up on Volume Down Key + OK button, and holding both simultaneously press the Power Button. Once you enter into the recovery mode, choose the options Wipe data/factory reset and also you need to select Wipe Cache partition. Click on “install zip from sdcard” to select the Rooting Package or the Unrooting package whichever you wish to and press the power button to confirm the selection. Once the file is selected, the rooting / unrooting process will commence. After the process gets completed, the device will be either restarting on its own or will land up in the recovery mode. In recovery mode, select “++++ Go Back ++++” and then select “reboot system now” for rebooting the device in the new firmware. Tip: Just in a rare case due to some reasons if the rooting / unrooting process gets failed or interrupted, then you need to apply the update again by following the steps again from the start. Don’t forget to restore the backup which you have taken in the initial steps. 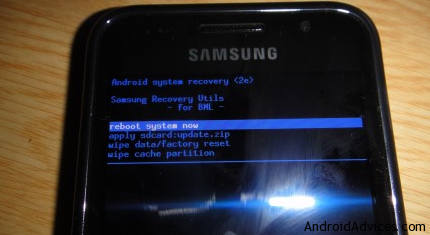 So there you go, you have now successfully rooted your Samsung Galaxy S GT I9001 smartphone. Do let us know in the comments section just in case if you face any issues as we will ensure that all the issues are sorted out at the earliest. root and unroot device is for what?